Background: The performance and results of corneal tattooing are described in a case series of 11 patients suffering from a disfiguring corneal scar using a technique similar to conventional dermatography. Methods: Drawing ink in different shades was applied into the anterior corneal stroma by punctures performed with a conventional spatula needle. Results: Up to 4 years after surgery all patients still had satisfactory staining of the formerly cosmetically disfiguring corneal scar. Conclusion: Tattooing of unsightly corneal scars proved to be an efficient and easy to perform technique, yielding acceptable results during follow up. Permanent colouring of unsightly corneal scars has been known for almost 2000 years.1 During the final decade of the 19th and the first decades of the 20th century it was a commonly applied technique.2–4 Owing to the tremendous progress in microsurgical reconstructive procedures, corneal tattooing today will only apply for a minor and carefully selected group of patients. We report on a pragmatic approach to this ancient treatment. In all 11 patients undergoing corneal tattooing (Table 1), there was no option of functional improvement by other treatments. An iris print contact lens was either not accepted by the patient or became increasingly uncomfortable. None of the blind patients were willing to undergo enucleation. Using an operating microscope, the colouring agent was applied into the anterior stroma—without previous removal of the corneal epithelium—by bevelled punctures using a three edged spatula needle (CSA-48 C; asymptotic spatula needle with micropoint) of a conventional 10.0 nylon suture (Ethilon EH 7998 G 10/0, Ethicon, Hamburg, Germany; this needle is available only in Europe). The needle was grasped with a Barraquer needle holder at the transition to the needle shaft and covered with ink before each puncture. Tangential punctures into the corneal stroma were carried out, creating a relatively long puncture canal. Since the corneal surface was obscured by the ink after several punctures, thorough irrigation with physiological saline was performed repeatedly to visualise the achieved effect. Care was taken not to change the direction of the punctures to avoid inadvertent excision of corneal tissue. Commercially available drawing ink (Rotring GmbH; Hamburg, Germany) in black (Art no 591017), brown (Art no 591014), and a blue shade (Art no 591009) was used for colouring. The ink was sterilised at 121°C for 15 minutes in sterile glass infusion bottles and aliquoted into samples of 2 ml. After autoclaving, we did not find any notable changes regarding the consistency in comparison with the non-sterilised ink. Adequate matching of the contralateral iris colour (which in patient nos 1, 2, 4, and 6–11 was brown) was achieved by applying variable quantities of these shades. In patient nos 3 and 5, who had blue and grey iris colour, respectively, we preferred tattooing an artificial pupil using black and blue ink (Fig 1A, B). (A) Patient no 3, central scar after perforating injury in childhood, mature cataract. (B) Result immediately postoperatively after tattooing a pupil. (C) Preoperative appearance of a 13 year old boy (patient no 1), perforating injury in childhood, repeated reconstructive surgeries. (D) Portrait of the same patient. (E) Result after removal of calcification using EDTA and simultaneous tattooing. Generally, slit lamp evaluation of the staining is somewhat disappointing, (F) while assessing the result from a 30 cm distance gives an astonishingly favourable impression; postoperative portrait. The scar of patients 1 and 10 showed marked calcification, which did not stain readily (Fig 1C). Therefore, removal of the calcified material in conjunction with EDTA application was performed immediately before tattooing. In patient no 2, the scar intraoperatively proved to be very fragile and tended to crumble. Therefore, the first treatment was stopped in order not to cause a substantial defect of stromal corneal tissue. After a 2 day interval, a second treatment was performed without any complications. Postoperative treatment consisted of gentamicin eyedrops and artificial tears, four times daily each, and pantothenic acid ointment overnight. Postoperatively, all patients complained about a moderate foreign body sensation and exhibited a conjunctival redness which corresponded to the surgically induced corneal epithelial defect. Complete closure of the corneal epithelium usually occurred 1 week after surgery. Slit lamp investigation did not reveal any relevant postoperative intraocular irritation in any of our patients. This also held true for patients 1 (Fig 1C–F) and 9, in whom there were accidental perforations into the anterior chamber. All but one patient were interviewed at the end of follow up (3–56 months, mean 27 months) regarding the lasting of the staining effect, scoring it as excellent/no fading, faded but still satisfactory, or unsatisfactory (Table 1). Staining was judged excellent by four and satisfactorily by five out of 10 patients. One patient complained about a pronounced fading; one was lost to follow up. Tattooing of cosmetically disfiguring corneal scars may be a valuable therapeutic alternative in a distinct group of patients. This group comprises patients in whom reconstructive surgical procedures either will not result in functional improvement or carry the risk of phthisis. Besides this, increasing difficulty in wearing a printed contact lens or a bulbar shell or the reluctant attitude of the patient towards repeated surgery (or enucleation) may be of importance. Out of the numerous modifications reported for corneal tattooing, it is not easy to choose the optimal one. While the ancient method of impregnation1 seems problematic due to rather unpredictable staining,4 there is sufficient evidence that lamellar keratectomy procedures give excellent results in terms of a homogeneous application of colour.5–8 On the other hand, many scars do not allow lamellar keratectomy owing to irregularity, thinning, or calcification. Taking into account the individual corneal changes of our patients, we decided to choose the dermatography-like manner of tattooing. According to literature, this approach has two theoretical problems. Firstly, because of the multiple incisions into the corneal stroma, and thereby an activation of phagocytosis, its results may not be of long duration.3,4 Secondly, it has been thought that the multiple lacerations of Bowman's layer might promote recurrent corneal erosions7—though, on the other hand, stromal micropuncture is known to be a treatment in case of recurrent erosions.9 Despite these objections, the staining in our patients was still satisfactory even after more than 4 years; recurrent erosions were not observed. A surgical difficulty inherent to this technique is the risk of accidental corneal perforation. Fortunately, we did not observe any sign of intraocular irritation in those of our cases, in whom this took place; and this phenomenon has also been reported by others.10 A further problem encountered in one of our patients (no 2, Table 1) was the inadvertent excision of corneal tissue. Although in this particular case we believe that the described problem occurred as a result of the presence of very fragile scar tissue, it has to be emphasised that the direction of the punctures must not be changed under any circumstances in order to avoid this risk. As corneal tattooing is not a frequent procedure performed in our department, we looked for a staining agent that was easily available and storable, avoiding the necessity of developing individual formulas in differing shades. Besides anecdotal reports on accidental but well tolerated incorporation of ink into corneal stroma,11 Holth reported very satisfactory results by using commercially available and sterilised drawing ink in different shades without any toxic effects.3 Sekundo and co-workers recently supported this assessment of ink as a well tolerated staining agent in their histological evaluation of specimens up to 61 years after corneal tattooing.12 These inks obviously are superior to the ancient china ink, which is well known to cause substantial inflammation.2,13 Nevertheless, despite of these reports and our own observation of lack of local or systemic toxicity, the composition of the ink used is a crucial point. As chemical analysis was not carried out, we cannot exclude possible toxicity. Owing to the manufacturer's stated policy we were able to obtain only incomplete information regarding this issue. Generally, these inks contain 85% water and 10% pigments. Soot particles achieve a black shade, the addition of pigment blue 15 (heliogen blue) a blue shade. These pigments are water insoluble. Therefore, absorption and systemic toxicity may be excluded. We were not provided with any information about the pigments added for the brown shade. Only sparse information is available regarding preservatives. Black ink does contain chlorocresol, which is of lower toxic potential than other phenols and is commonly used in creams, external disinfectants,14 and even ophthalmic preparations.15 For emulsification, non-ionic surfactants are added. These substances otherwise are widely used in cosmetics, drugs, and food.14 The same holds true for shellac and 1,6-hexanediol, which are added for moisturising: Shellac is used as coating for pills and tablets,14,16 while polyalcohols like 1,6-hexanediol are known to be ingredients of ripe fruit.16 In summary, we consider the components of this ink to be of little toxic potential. However, different products may vary considerably in their composition. Therefore, we do not recommend using another ink from the one described in the present study and would hesitate to perform this procedure in sighted eyes. In conclusion, the following two factors enabled the simple performance of corneal tattooing: the application of a standardised staining agent, and the use of a needle readily available in any ophthalmic surgical department. While we did not observe any relevant complications, the described method achieved surprisingly good results, not only from our, but also the patients', point of view. None of the authors has any financial or proprietary interest in any item described in the presented study nor has there been any private or public support. Galen C. De compositione medicamentorum secundum locos. In: Kühn CG, ed. Claudii Galeni opera omnia. Hildesheim: Olms, 1965;vol 12:696–803. Knapp P. Eine neue Methode der Hornhauttätowierung. Klin Monatsbl Augenheilkd 1925;75:693–700. Holth S. Die Technik der Hornhauttätowierung, speziell der mehrfarbigen. Klin Monatsbl Augenheilkd 1926;77:289–302. Gifford SR, Steinberg A. Gold and silver impregnation of cornea for cosmetic purposes. Am J Ophthalmol 1927;10:240–7. Burris TE, Holmes-Higgin DK, et al. Lamellar intrastromal corneal tattoo for treating iris defects (artificial iris). Cornea 1998;17:169–73. Remky A, Redbrake C, Wenzel M. Intrastromal corneal tattooing for iris defects [letter]. 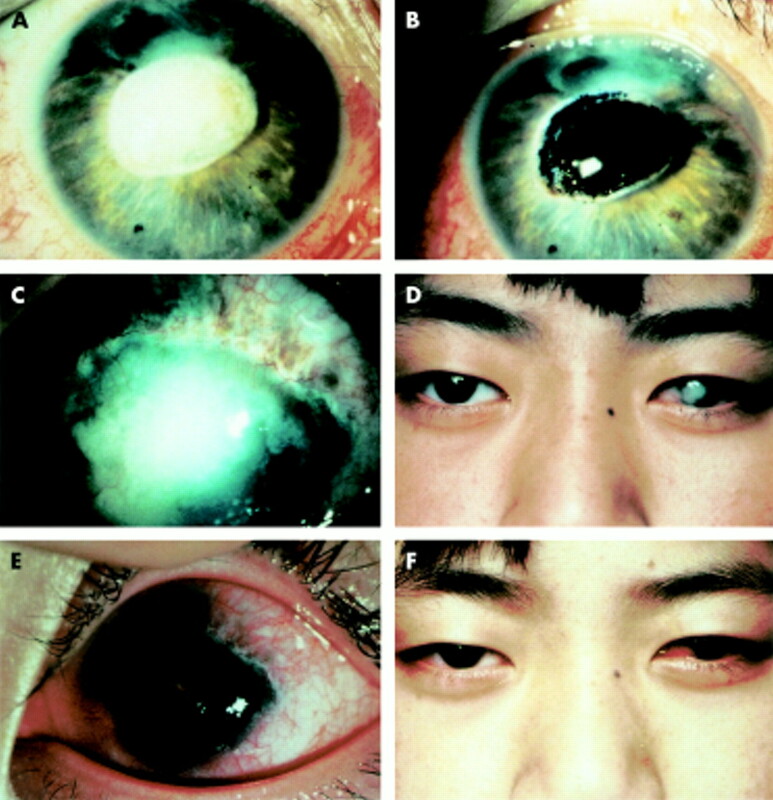 J Cataract Refract Surg 1998;24:1285–7. Panda A, Mohan M, Chawdhary S. Corneal tattooing—experiences with “lamellar pocket procedure.” Ind J Ophthalmol 1984;32:408–11. Anastas CN, McGhee CNJ, Webber SK, et al. Corneal tattooing revisited: excimer laser in the treatment of unsightly leucomata. Aust NZ J Ophthalmol 1995;23:227–30. McLean EN, MacRae SM, Rich LF. Recurrent erosion: treatment by anterior stromal puncture. Ophthalmology 1986;93:784–8. Reed JW. Corneal tattooing to reduce glare in cases of traumatic iris loss. Cornea 1994;13:401–5. Von Wecker L. Das Tätowiren der Hornhaut. Arch Augenheilkunde 1872;2:84–7. Sekundo W, Seifert P, Seitz B, et al. Long term ultrastructural changes in human corneas after tattooing with non-metallic substances. Br J Ophthalmol 1999;83:219–24. Duke-Elder S. Tattooing of the cornea. In: Duke-Elder S, Leigh AG, eds. Duke-Elder's system of ophthalmology. London: Kimpton, 1965;Vol VII:645–7. Martindale—the extra pharmacopoeia. Parfitt K, ed. London: Pharmaceutical Press, 1999; 32nd ed. Weller PJ. Chlorocresol. In: Wade A, Weller PJ, eds. Handbook of pharmaceutical excipients. 2nd ed. Washington and London: American Pharmaceutical Association/The Pharmaceutical Press, 1994:114–16. Fiedler HP. Lexikon der Hilfsstoffe für Pharmazie, Kosmetik und angrenzende Gebiete. 4th ed. Aulendorf: Editio Cantor Verlag, 1996.